On this bright March day in Los Angeles, my thoughts are turned to Japan. I write on a page that is white like the snow in Suibara, I remember the bright whiteness of 5000 Siberian swans wintering in Lake Hyoko. 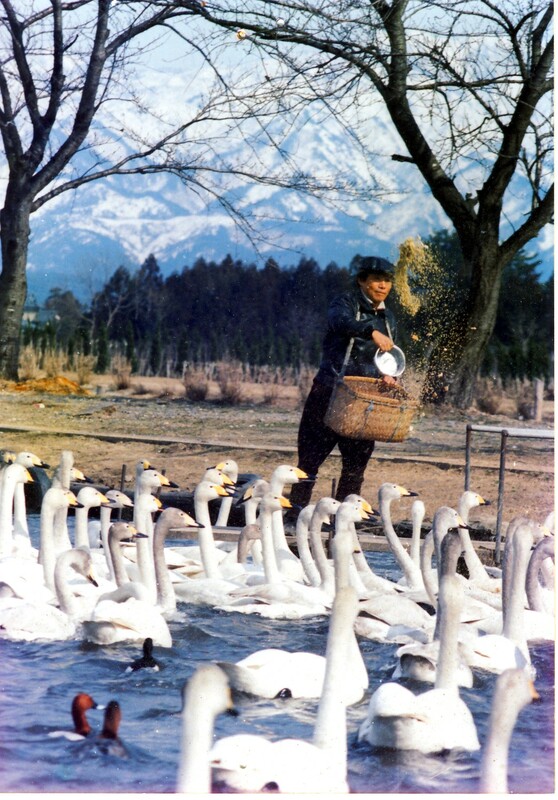 In my minds eye I see the Swan Uncle making his rounds to feed them, the Suibara children who form “swan patrols” to protect their yearly avian visitors. I’m thinking about the communal grace with which Lloyd and I were received in this small town, our only connection a blood-speckled flag my father retrieved from a battlefield in Luzon and subsequently sent home to my mother in the United States. I discovered the flag among my father’s letters after he died. TO YOSHIO SHIMIZU IN THE GREAT EAST ASIAN WAR… IF YOU BELIEVE IN IT YOU WILL WIN. The flag belonged to a young man named Yoshio Shimizu who grew up in this village. The day we arrived the villagers lined the streets waving American and Japanese flags. I wondered if it were some sort of holiday but our visit was the occasion, the mayor informed us. Yoshio’s family was waiting for us, they were waiting for the flag which was in a box in my backpack, they were waiting for a messenger bearing tidings about their relative fifty years after his death on a battlefield in Luzon. 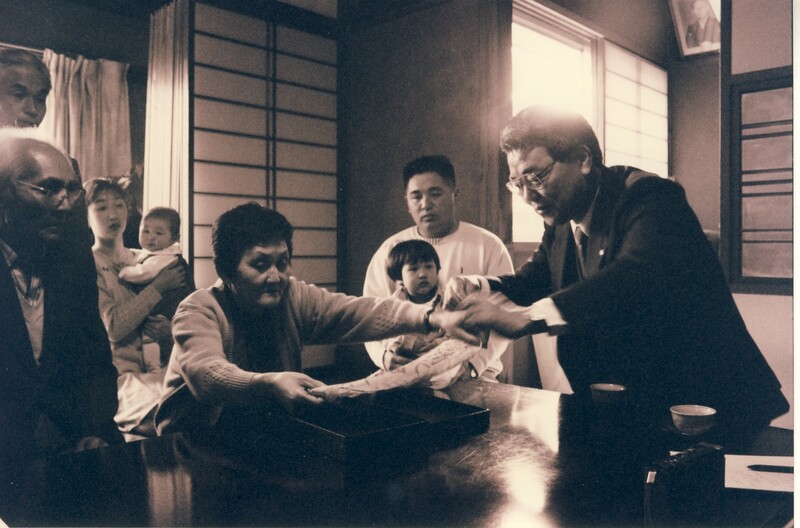 They received us like long-lost family, nearly 70 people crowded into the Shimizu home to watch and participate in the dignified ritual of Yoshio’s flag returning home, into the hands of his sister Hiroshi. Yoshio was only 21 when he died. 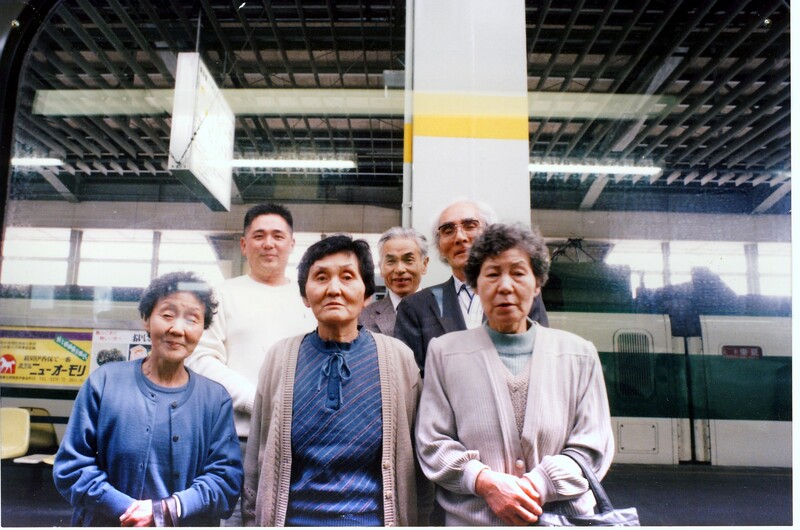 The day we arrived in Suibara to return the flag was April 15, 1995, also the day the demented guru Shoko Asahara (whose minions had released sarin gas into the Tokyo subway system) had predicted as doomsday. No such apocalypse happened, but in the middle of that beautiful ceremony in Suibara, the room began to clatter and shake. We all sat frozen on the tatami map. An earthquake. When it was over, we cautiously smiled at one another. There. We’d been through something together. Now I’ve finally heard from Masako Hayakawa, my translator, that she and her family are safe. She called the Shimizu family to check on them for me and they are safe as well. Though she related the sad news that dear Suezo-san passed away more than six months ago. Before my last visit to Suibara, he dreamed I was coming. He was the one who met Lloyd and me at the bus stop on that bright morning of April 15, 1995, when two Americans disembarked wearing the backpack containing the box with the flag of Yoshio Shimizu. Holding Japan in my thoughts, in my heart.